One of the most popular sights in Hollywood, Grauman's Chinese Theatre is best-known for the hand- and footprints in its forecourt. No matter how much tourists claim that they're not star-struck, within a few minutes, they're sticking hands and feet in the prints and snapping photos. This theatre is also one of the most beautiful and best-preserved of the movie palaces from Hollywood's golden era. With its Chinese theme and gold-and-red decor, the interior often upstages the films on the screen. You'll almost always find street performers on the sidewalk in front, dressed up as everything from Homer Simpson to Wonder Woman. If you take a picture with them, keep in mind that they're making a living by posing with you. Give them a small tip - a dollar will do. Almost everyone who visits the Chinese Theatre does this. For some people, it's the idea that counts, more than the details. The square they're posing next to belongs to Douglas Fairbanks, one of the first to put down handprints and footprints at Grauman's. Unless these lovely ladies are fans of early 20th-century cinema, it's unlikely they know who he was. They're having fun anyway, though. In 1927, Hollywood's original "It" couple Mary Pickford and Douglas Fairbanks placed their hands and feet in wet cement. Since then, more than 200 prints have accumulated in the Grauman's Chinese Theatre forecourt. Besides the assortment of expected human hands and feet, three horses have imprinted their hooves here: Gene Autry's "Champion" Roy Rogers' "Trigger" and Tom Mix's "Tony." Actor Jackie Chan continued that tradition by imprinting his nose. He also inscribed a heart and the word Peace. Chan's story is also an unusual one. He is the first star to have his prints done twice. His original imprints were made in 1997, but they mysteriously disappeared. The replacements were done in 2013. You'll also find prints of Groucho Marx's and George Burns' cigars, John Wayne's fist, Whoopi Goldberg's dreadlocks, Jimmy Durante and Bob Hope's noses, robot R2D2's tread marks, Al Jolson's knees, Roy Rogers' and William Hart's six-guns. With limited space, Grauman's only adds new prints only once or twice a year. The ceremony is fun to watch and it's a good opportunity to see stars in person, so you may want to find out how to see one. In case you wonder about the "Sid" mentioned in many early inscriptions, he's Grauman's Chinese Theatre creator Sid Grauman. And here's a dirty little secret you might not know. Not all the imprints ever made are on display. According to BBC.com, slabs are changed often to make room for new entries in the collection. The inside of the Chinese Theatre is a throwback to the days of gorgeous movie palaces. The best part of the show is when those red curtains swish open to reveal the latest film. If you want to watch a film in this theatre, you need to know that this is a multiplex cinema. To be sure you're getting into this one, confirm at the box office. Tours are offered 7 days a week, but it's just as easy to buy a ticket to see the film currently playing. If you're a big fan and really curious, you may also enjoy reading Hollywood at Your Feet: The Story of the World-Famous Chinese Theatre. Its photos and informative captions depict every contributor to the forecourt masonry. Grauman's Chinese Theatre opened on May 18, 1927, with the premiere of Cecil B. DeMille's The King of Kings. Fans lined Hollywood Boulevard to see the stars who turned out for the event. 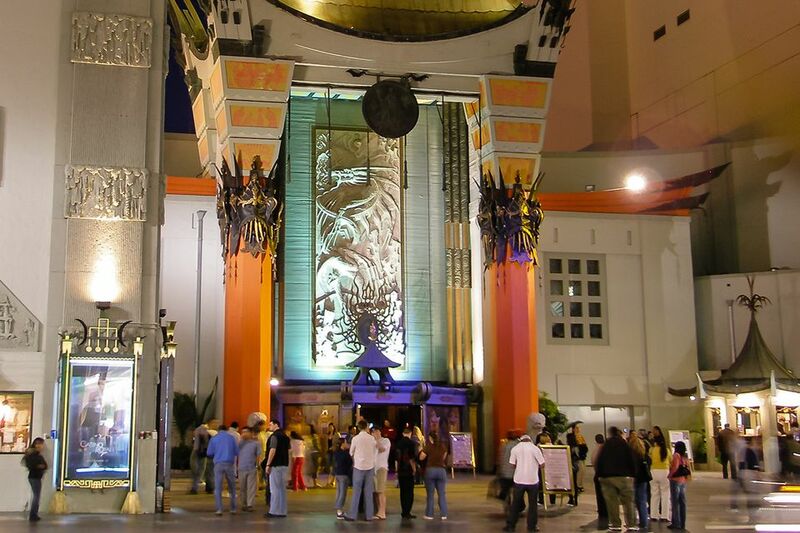 Today, Grauman's Chinese Theatre is still among the most sought-after theatres in Hollywood for studio premieres. Tickets to these events are by invitation only, but you can watch from the street. It's easy to tell if one is planned by all the activity and setup out front - and if you check movie schedules online, you may notice no regularly-scheduled films from mid-afternoon through evening. These gaps are easier to see at IMDB, entering zip code 90028. The forecourt is open 24 hours a day and the theatre shows films daily. Allow about half an hour to see the footprints. It can be crowded and hot in the middle of a summer day. Go early if you want photos without so many annoying strangers in the background. It's also especially pretty at night. Because Grauman's is such a popular spot for movie premieres, you may find the forecourt filled with cameras, light, carpets, and technicians. Getting there in the morning will give you the best chance of avoiding this disruption. Grauman's Chinese Theatre is at the northeast corner of Hollywood Boulevard and Orange Drive. From US 101, take the Highland Avenue exit and go south. The Hollywood and Highland parking lot is most convenient. The entrance is on the right about half a mile down the hill. The Los Angeles MTA (Metro Transit Authority) Red Line Hollywood and Highland stop is just steps away. Other attractions near Grauman's Chinese Theatre include Hollywood Walk of Fame, Hollywood and Highland and Hollywood Boulevard.